Cars like Accent and City are called Sub-compact sedans. They are an affordable version of high-end sedans only missing on some luxury features and shading a bit on the dimension front. Overall they fulfill middle-class big car dream. In the Philippines market, this segment is a sensation, look out on the road, and you’ll know what we mean. Because of such high demand and a promising future ahead, automakers have added such cars in their fleet, giving them regular updates suiting market trends. 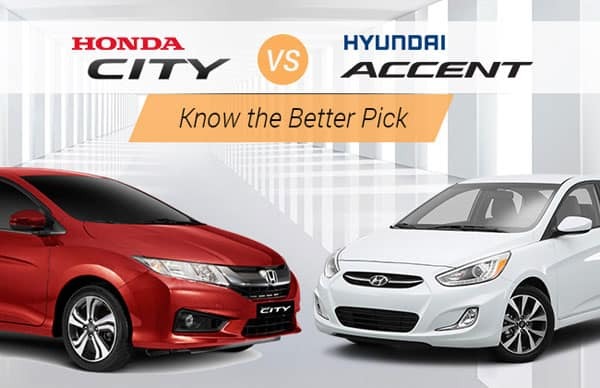 Two such popular cars in this segment are Honda City and Hyundai Accent, Japan vs. Korea. 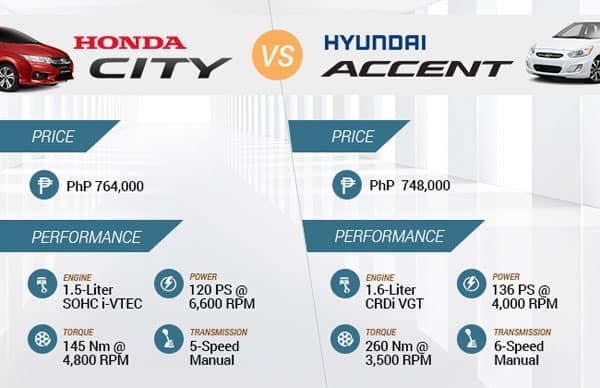 Before starting with the comparison, we’ll like to inform you that there is a news of an all-new Accent to enter the Philippines market. Though the company has made no official announcement yet, hopes are high, and we expect to see some significant transformation. 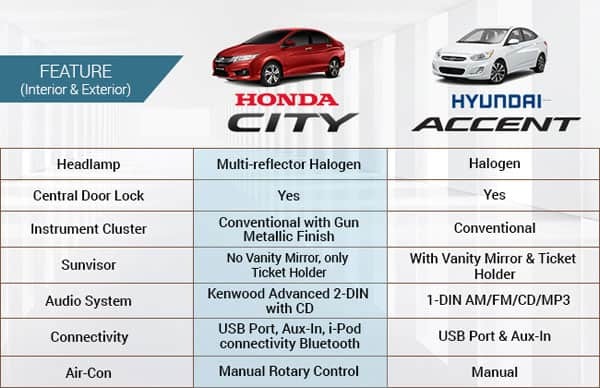 As for the current scenario, let’s see what the ongoing Honda City (new generation launched in late 2016) and Hyundai Accent has on the plate to offer. As can be noticed from the image above, there’s not much difference between the two cars regarding price. Thus, picking one over the other is difficult merely on price parameter. Therefore, it becomes important to look at other aspects in order to come to a conclusion. Also, the above image makes a very clear point. If a buyer is more driven by performance than Accent undoubtedly will satisfy him is a better. From engine to transmission is has more to offer. Buying Honda City will get you more cabin space w.r.t greater wheelbase. Also, trunk capacity is so much more in Honda’s car that Accent stands nowhere near it. Talking of the Ground Clearance, City will maneuver easily with its lower parts at a lower risk of hitting/touching objects on the road. The City looks a bit more advanced over Accent in the feature domain. On the basis of safety comparison, City seems to carry more protecting features. 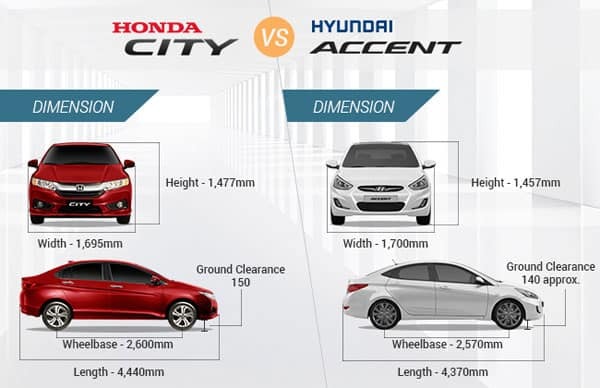 Accent has a more affordable price tag and has a stronger performance spec of the two. But at the same time lacks in features and safety. City, on the other hand, is more expensive but it is compensated via wide array of specifications in diverse field. Analyze what you want from your car, affordability, performance or features. Once you know it making a choice won’t be difficult.